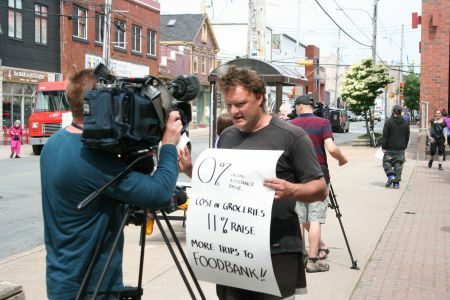 KJIPUKTUK (Halifax) - You regular readers of the Halifax Media Co-op may remember reading my articles about the systematic problems with the Social Assistance “special needs” policies and how it affected me personally. You also may remember reading another article, by Rana Encol, about how I appealed when my special diet allowance was discontinued and fought my case all the way up to the Nova Scotia Supreme Court, but lost. Just as a reminder. I live on social assistance and I need a high protein diet for impulse control disorder. There is medical research (attached below) which proves that protein does help control impulse disorder. However, the Department of Community Services does not want to pay for my special diet needs. The reality is that I am required to have an intake of omega 3 products to help my obsessions and complications related to my impulse disorder. Omega 3 oils. Now that I am getting less of an Omega intake in my day to day diet, I find that my obsessive and compulsive behavior kicks in more. I tend to fidget more. Furthermore, I have a hard time relaxing. There have been times when I could not get my proper intake of Omega 3 that others have felt uncomfortable around me because of my behavior. It also causes anxiety attacks, which is exactly what has happened to me from time to time since loosing that special diet. In today’s article, I am writing about my account as a first voice person talking about what moving forward from what happened was like. This is a matter where I feel I need to be persistent, because as an old saying goes “Nothing happens overnight”. After all being persistent in searching for justice and to hold Department of Community Services accountable is important, especially where I am not alone with dealing with the experience of what happened to me. However this article is my first person account. I live my day to day life these days knowing there is Income Assistance reform happening. However the question I raise here is “is this reform going to resolve my issue”? With the way our current Minister of Community Services, Joanne Bernard is talking in her media comments, it is not sounding too promising. After all, in my case not only I had lost the $66.00 from my budget, also two of my doctors got harassed by Community Services, with Community Services calling them up and questioning them on why I even need this special diet in the first place. Enforcement of this section of the policy has ruined my relationship with one of my doctors, all because of him being frustrated and offended. These actions of the department did an awful lot of damage both financially and emotionally. Because of what happened, there have been times when I have had anxiety attacks. I wanted to blame the department for those anxiety attacks. After all those anxiety attacks were caused by lack of funds to support the dietary needs for my disability. I knew however, doing this would get me nowhere in getting what happened resolved. Also I was advised by my lawyer and my MLA not to formally blame those on the Department of Community Services. 1 – The way section 6.3.3 of the Community Services policy manual is worded is clearly a human rights violation, and this section of the policy plus section 25(a) allow my caseworker to get away with acting like he or she is the medical professional. Therefore the Department of Community Services must change the wording of these parts. Also, the Department must understand how the health of different people is affected by this. 2 – I want to have meeting with the ESIA policy directors I would like this meeting to take place in a tribunal setting with a human rights officer as well as my lawyer present. The Department needs to understand how their actions have violated my human rights. 3 – The enforcement of the policies I mentioned in # 1 made two of my doctors feel like they were being harassed by the Department Of Community Services. I want both doctors to receive formal apologies from the Department Of Community for the harassment, and frustrations they were put through by this happening. 4 - Whereas the enforcement of ESIA policy section 6.3.3 had made things A-bit more difficult for me to be able to afford foods which my medical condition requires me to have, (After-all I did lose $66.00 from my ESIA budget as a result), I want a personal apology from the Department Of Community Services for the personal frustration they had put me through over the past couple of years. 5 – I lost $66.00 from my income assistance budget, as of February 26th of 2013, I want the Department directed to reinstate my losses. As well, I want back pay for the past now two years and four months and counting. When you live in poverty of any type (in my case on Income Assistance), every little bit that a person can receive to live on is a help. Losing that $66.00 from my Income Assistance budget and how everything went down in my case has caused me a scare which I am now going to have to deal with for the rest of my life, unless by some miracle what happened to me gets resolved. These days a miracle is all I can hope for. They don't acknowledge us as human, apparantly. Submitted by Erica Lewis on jeu, 09/24/2015 - 12:15. I have been reading the posts in here regarding your plight. When I lost $200 off my cheque, a Google search for "ESIA Nova Scotia cuts to special needs" led me to Halifax Media Co-op, which I had not heard of before. I don't need to look at that PDF. I already know the many health benefits of omega-3 fatty acids. It's been common knowledge for a long time now but DCS doesn't care. If the government was so concerned with saving money, they would give us money for a healthy diet and other needs as poor nutrition and extreme stress destroy one's health, thereby burdening the health care system. Idiots, plain and simple. I have been taking fish oil for years and ESIA pays for it. Once a year, I send in the reciepts for all my supplements, which total more than $100.00, along with the doctor's letter stating I need them. If they are not going to pay for the diet, get them to pay for the supplement. Back pay, you say? They will owe me $1560.00 a year just for my taxi fares alone.